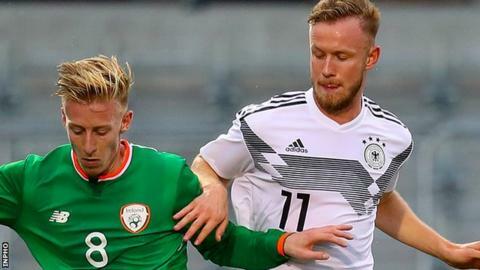 The Republic of Ireland were beaten 6-0 at home by Group Five leaders Germany in Tuesday's European Under-21 Championship qualifier in Dublin. Aaron Seydel gave Germany a sixth-minute lead while Schalke 04 forward Cedric Teuchert scored a hat-trick, including two penalties. The Irish conceded a third penalty late in the game which Suat Serdar netted. Serdar scored again to complete the visitors' emphatic win, giving them a five-point lead at the top. It means that, with just two matches left, the third-placed Republic's hopes of automatically qualifying for next year's finals are all but over. Noel King's boys must hope to pick up points from October trips to Israel and Germany in their push for a play-off place. After Seydel's earlyopener, home boss King was forced to make an early change as Yeovil's Shaun Donnellan replaced injured Cork defender Sean McLoughlin. Germany doubled their lead with a penalty from Teuchert on 22 minutes after Jake Mulraney fouled Lukas Klostermann. Teuchert scored his second on 65 minutes after being set up by Florian Neuhaus to put the match beyond the hosts. The Schalke man completed his hat-trick when making it 4-0 from the penalty spot on 72 minutes when Liam Kinsella fouled Max Eggestein. Marco Richter saw his shot hit the woodwork, before, with nine minutes left, Germany were awarded another penalty when Hearts midfielder Mulraney fouled the Augsburg man. This time substitute Serdar, on at the start of the second half, converted. Schalke midfielder Serdar flicked home another with a back-heel on 85 minutes to complete the rout.